A Samsung smartphone with model number SM-G532F was spotted on Indian import website Zauba earlier this month. Now, it turns out that smartphone is none other than the Galaxy Grand Prime (2016). 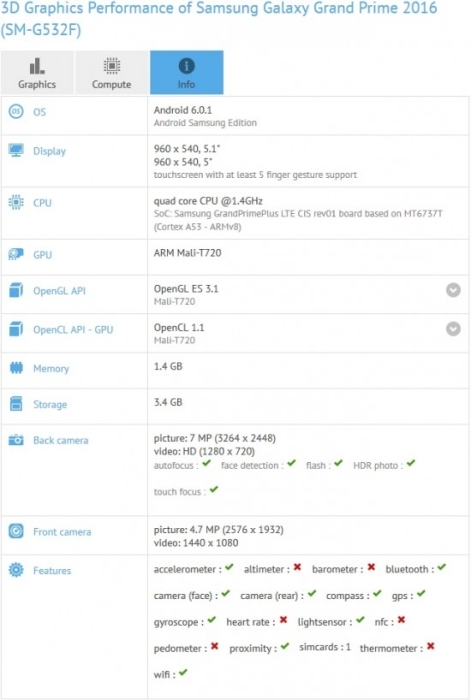 The Galaxy Grand Prime (2016) has appeared on GFXBench with the same model number while revealing its specifications. The Galaxy Grand Prime (2016) listed on GFXBench is powered by a MediaTek MT6737T quad-core processor which is clocked at 1.4 GHz. The device comes with 2 GB RAM and Mali-T720 GPU. The Galaxy Grand Prime (2016) runs on Android 6.0.1 Marshmallow and might feature a 5/5.1 inch display having 960 x 540 pixel resolution. The device is listed with 3.4 GB user available internal storage, however, we think it might actually come with 8 GB internal storage along with an option to expand the storage via microSD card. The Galaxy Grand Prime (2016) is listed with 8 MP rear camera and 5 MP front camera. The device has also appeared on Geekbench with the same model number and scored 599 and 1790 points in single-core and multi-core tests.